LA PORTE, TX (KTRK) -- A La Porte man is accused of donning a zebra mask and brandishing an AK-47 to rob two La Porte hotels earlier this month. Keith Duncan cracked a brief smile as he made his first court appearance today. The charges he's facing, however are no laughing matter. Police say Duncan is the man seen in motel surveillance video wearing a zebra mask and carrying an AK-47. "He would approach the front counters and demand cash from the clerks," said Sgt. John Krueger with the La Porte Police. Duncan is accused of robbing a La Quinta and a Quality Inn, both in La Porte on June 3. Eyewitness News found Duncan's girlfriend, Peyton Ray, who told us Duncan was acting normal the hours before the alleged crimes. "We were watching movies," she said. We then asked if Duncan left the house. "I guess so," said Ray, "I went to sleep." Police say an anonymous tip led them to Duncan. 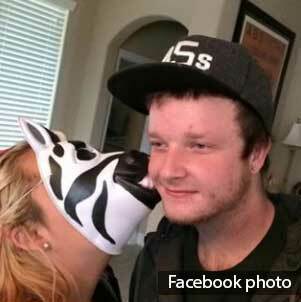 When they checked his Facebook page, they saw a photo of his girlfriend wearing what appears to be the same zebra mask, and giving Duncan a kiss. That was a major break in the investigation. "The mask was actually part of it on Facebook, and there was some discussion as to the specifics of the crime," said Sgt. Krueger. Armed with the Facebook photo and surveillance video, investigators were able to nab Duncan. Police also recovered a loaded AK-47 legally owned by Duncan. "He confessed and he is currently waiting for his time," said Ray. If convicted, Duncan faces between 5 and 99 years in prison and up to a $10,000 fine.